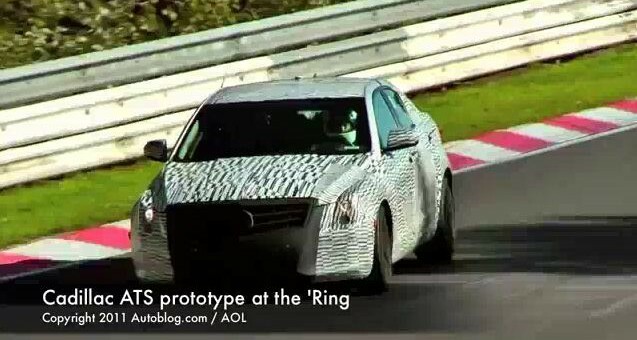 There have been spy photos, teaser images, even renderings of the upcoming Cadillac ATS, which is slated to launch sometime in the middle of 2012. But a high resolution spy video of the ATS running laps around Germany’s infamous Nürburgring is about as good as automotive espionage gets, and that’s exactly what we have here thanks to Autoblog. If you listen closely around the 40-second mark, you can hear some high-revving engine notes emitting from the upcoming BMW 3 Series fighter — the likes of which we’ve never heard from General Motors vehicle before. Just what could be powering this machine? We hope to find out before year’s end… possibly at the 2011 Los Angeles Auto Show in November, if not sooner. Previous story Rumor: 2013 Chevy Spark To Enter U.S. Market With 1.2L 80 Horsepower Engine? Spoke with a Cadillac representative today at a small “auto show” being hosted in NYC’s World Trade Center – Winter Garden. He indicated that The XTS would be revealed at the LA auto show in November 2011 and be available for sale in April / May 2012. He also mentioned that the ATS would be shown at the Detroit autoshow in January 2012 and available for sale in June / July 2012. Finally, he confirmed a coupe, 4-door sedan and a wagon and that he has personally seen it and that it will be great! To be honest I doubt that a simple representive would have the authority to reveal such classified information to a mere passerby. Though the information does seem mostly correct although I would think the ATS wuld be at LA and XTS at Detroit. But who knows, you may be right. But the XTS launches before the ATS. So it would make sense to see an XTS at a show first. I didn’t hear LS3, i’ll listen again. Heard it, non supercharged. 1:50 mark is clearest sound. You sure that’s not the Porsche passing by? It must be pretty light because it seems to be moving at a very high clip.